"NOODLES ARE THE SPECIALTY AT SANAMLUANG. 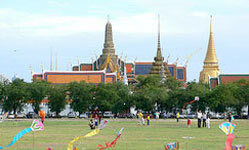 sanamluang is an oval public ground in front of the Grand Palace. The enclave is used for various royal ceremonies, including the Royal Ploughing Ceremony, and is surrounded by several noteworthy institutions.